The article was originally published at Atlantic Council. By UDI Associate Maria Shagina. Showing solidarity with other G7 countries following Russia’s 2014 invasion of Ukraine, Japan imposed sanctions on Russia—albeit reluctantly. The Ukraine crisis occurred amid Japan’s efforts to reinvigorate Japan-Russia relations in the hope of solving the long-standing territorial dispute over the Northern territories (the Kuril Islands in Russian). Subsequently, maintaining Japan’s balance between other G7 countries and Russia became one of the main challenges for Prime Minister Shinzo Abe. 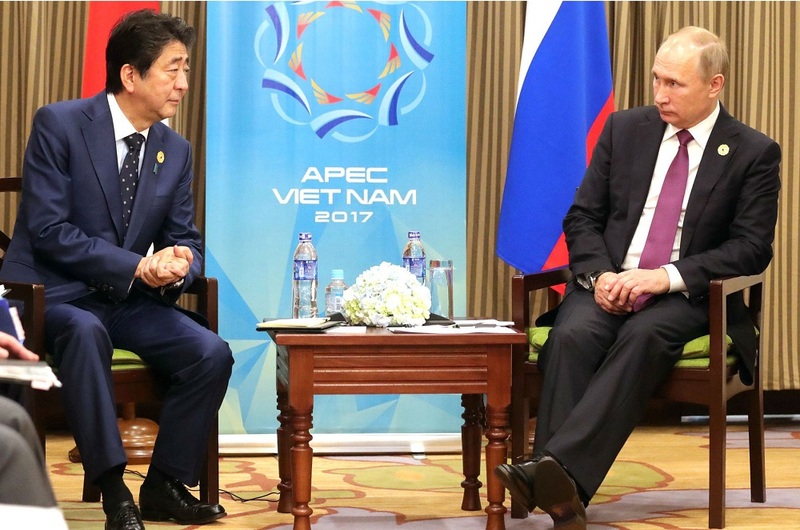 While Japan felt obliged to support the international community and to impose sanctions, the geopolitical dynamics in the Asia-Pacific region forced it to take a conciliatory approach to Russia. This delicate balance resulted in Japan’s symbolic sanctions and in different narratives promoted at home and in Ukraine. Tokyo did not recognize Crimea’s independence and condemned “an attempt to change the status quo by force” as Abe put it. Nonetheless, Japan introduced its sanctions only after pressure from the United States, and the punitive measures were limited and toothless. Japan’s public list of targets was restricted to Ukrainian separatists from Crimea and the self-proclaimed republics. The other list of twenty-three Russian high officials was never made public. In fact, there is some speculation as to who might be on the list, considering there was a series of visits to Japan by Russian high officials, including Sergey Naryshkin, Valery Gerasimov, Viktor Ozerov, and Igor Sechin—all of whom are on the United States’ or the European Union’s sanctions lists. We do not know if there are any high officials on the list at all. Japan’s sanctions do not target the energy and defense sectors. Although Japan introduced asset freezes for certain Russian policymakers, they have no substantial financial assets in Japanese banks. Since December 2014, Japan has not upgraded its sanctions regime, but it continues to follow the line of G7 statements. Japan’s sanctions reveal the country’s strategic interests and reflect the geopolitical dynamics in the Asia-Pacific region. The territorial dispute with Russia, China’s rising economic and military power, and the North Korean crisis have all shaped Japan’s soft response to Russia. For Japan, Russia is the main partner in securing regional stability. Russia is treated as an Asian power with weak power projections and no revisionist intentions; Japan does not see it through the lens of its wrongdoings in Ukraine and Georgia. In fact, the Abe administration keeps its relations with Russia separate from the ongoing conflict in Ukraine, in the hope of solving Japan’s territorial dispute with Russia that has lasted over seventy years. In 1945, the Soviet Union occupied a group of islands off the coast of Hokkaido and since then Japan has unsuccessfully tried to reclaim them. Second, Japan’s reluctance to impose sanctions was driven by a desire to avoid further isolating Russia internationally, and to prevent the emergence of a strong Sino-Russian axis. In short, Japan’s Russia sanctions were used as a tool of deterrence for China, not Russia. Tokyo fears that the annexation of Crimea and NATO’s unsatisfactory response could serve as a precedent for territory-hungry China. From Japan’s point of view, Russia’s actions could embolden China to act more assertively in the disputed Senkaku (Diaoyu) Islands in the East China Sea. Finally, the presence of North Korea mitigated Japan’s sanctions. The North Korean nuclear crisis—Japan’s second security threat after China—is more urgent for Japan than Ukraine. With the involvement of Russia, Japan has hoped that Moscow could play a positive role in the peace talks. Despite Japan’s weak response to Russia, generous economic and humanitarian aid was given to Ukraine. Since March 2014, Japan’s assistance to Ukraine amounted to $1.86 billion, making Japan one of Ukraine’s largest international donors. The timing of the aid is interesting and seems designed to counterweigh the weak sanctions. Japan’s assistance was directed toward improving the economy, restoring democracy, and promoting inclusive political dialogue. Some $400 million was given directly to Ukraine’s budget, while a $1 billion no-interest loan was given for the modernization of the Bortnychi sewage treatment plant near Kyiv. Various grants were allocated through the Council of Europe and the OSCE to support election-related activities and judicial and anti-corruption reforms. To alleviate the humanitarian crisis in eastern Ukraine, emergency grants were given to internally displaced people through the United Nations Children’s Fund and the International Federation of Red Cross. In February, Japan announced its plan to give another $3.6 million. In Kyiv, Japan’s response is viewed positively. As Ukraine seeks to garner international support, any sanctions are welcomed regardless of their effectiveness. In the Ukrainian media, Japan is praised for being the only Asian country to impose sanctions on Russia. Indeed, China and India abstained from voting on a resolution condemning Crimea’s annexation at the UN Security Council and the General Assembly; meanwhile, South Korea and Singapore criticized Russia’s actions, but refrained from imposing sanctions. Among these Asian voices, Japan’s position on Russia looks the strongest, and Japan underlines this status to the Ukrainian government and public. But in Russia, the symbolic nature of Japanese sanctions is emphasized. In Ukraine, Japan keeps a low profile about its strategic partnership with Russia, preferring to emphasize the similarities between both countries. Often parallels are drawn between Crimea and Japan’s Northern territories; the two territorial disputes are viewed as a shared challenge in which the status quo was changed by force. “Your fight against Russia and our fight against Russia should be coordinated,” claimed Kazuyuki Hamada, Japan’s former vice minister of foreign affairs, at the Kyiv Security Forum last month. This narrative, however, differs greatly from the domestic discussion in Tokyo, where no parallels are drawn between Russia’s occupation of Crimea and the Northern territories: Tokyo wants to avoid upsetting Moscow. For the same reason, Japan opted out of the UK’s call to expel Russian diplomats over the Skripal case and gave no direct support for airstrikes in Syria, claiming there was a lack of evidence. But as international pressure against Russia rises, Japan will find it more difficult to maintain its delicate balance between the G7, Russia, and Ukraine. Maria Shagina is a JSPS Postdoctoral Fellow at Ritsumeikan University (Japan). She is affiliated with the Geneva International Sanctions Network and author of the book Joining a Prestigious Club.